Homemade Soft Artisan Beer Pretzels - Made It. Ate It. Loved It. I have always been a huge Krusteaz fan! We use their products almost weekly. Especially their waffle and pancake mixes. So when I received a package from them I was so excited to be working with a company that I already knew was a hit in our house! As I looked through the package I noticed a box of “beer bread mix” that was one product of theirs that I had yet to try! I wanted to make something new but yummy! And then I realized that soft pretzels would be just the pair for this bread mix and boy was it perfect! I will admit that this was my first time buying beer. I almost had a heart attack buying it because I was so nervous! Haha I drove to a gas station a couple miles from my house just to avoid the fact that I may run into someone that I know and that they would wonder why I was buying a can of beer at 9 A.M. with my baby and 3 year old in hand. (I am sure my husband is going to love this story haha) I then had to text my mom to make sure that all the beer would be cooked out and then I text her again just to double check! 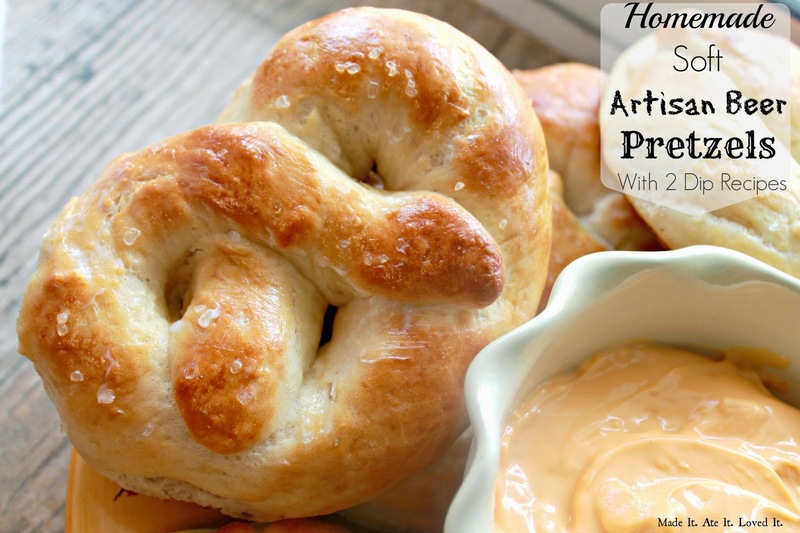 And well among all the chaos these “Homemade Soft Artisan Beer Pretzels” were born! I ate one for breakfast, one for lunch, and then my family enjoyed them for dinner! Preheat oven to 425 degrees F. Then in a mixer, place warm water, sugar, kosher salt and mix together. Then add yeast. Let sit for 10 minutes. Then add in butter, beer, krusteaz beer bread mix, flour, and 1/2 teaspoon salt. Mix until well combined about 8 minutes! The dough should be sticky but pull away from the sides. If dough is too sticky slowly add more flour while you continue to mix. Grab a large bowl and greased it. Place the dough in the bowl and cover. Let rise for 1 hour. Once the hour is up lightly grease counter space. Separate dough into 10-12 balls. Then take one and roll it into a long snake about 15 inches. 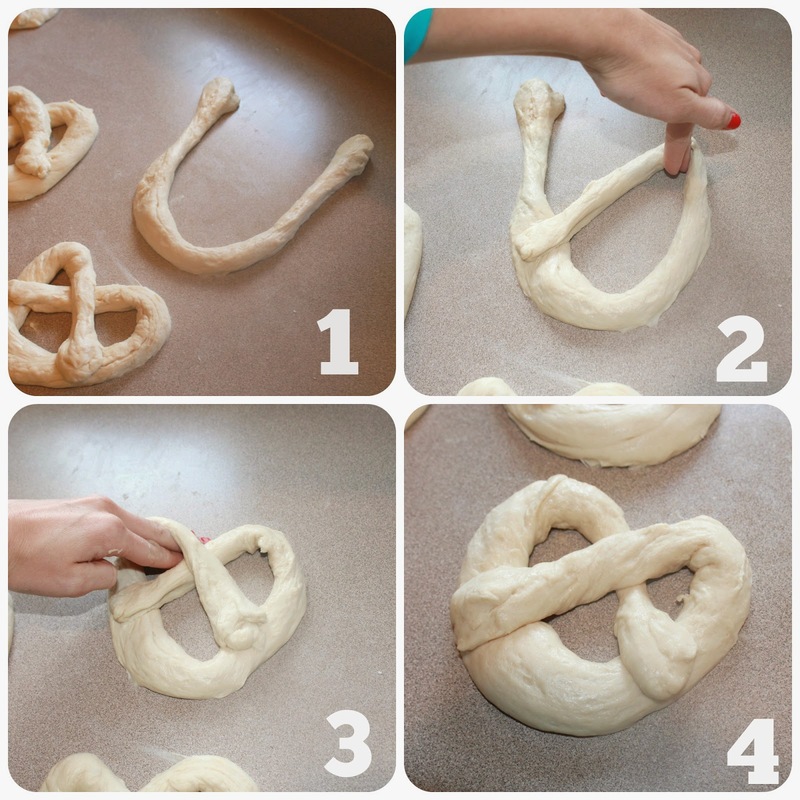 Then make a “U” shape and then make a pretzel. Then in a medium sized bowl place hot water and baking soda. Grab 2 cookie sheets and grease them and then set aside. 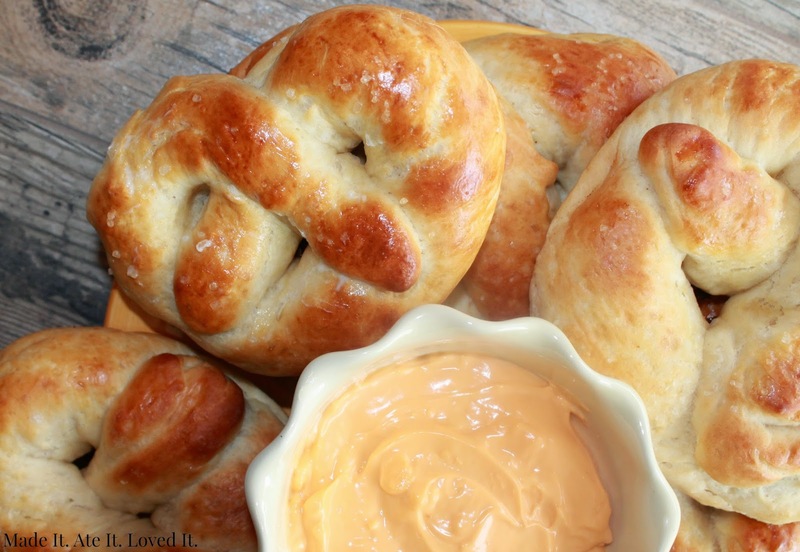 Dip each pretzel in the water/baking soda mixture and let sit in there for 5-10 seconds. Then place on cookie sheet. Continue those steps until all pretzels are done. Let sit for 10 minutes. In another small bowl beat the egg. Once the 10 minutes are up lightly brush pretzels with the egg wash. (This will make them shiny when they are cooked!) And sprinkle with course sea salt! Bake for 12-15 minutes or until golden brown! Serve with honey mustard dipping sauce or nacho cheese sauce! In a saucepan over medium heat melt butter. Then whisk in flour. Pour in milk and continue to whisk. It will thicken up. Add in salt and then cheddar cheese and mix until all the cheese is melted. Continue to whisk until sauce thickens. Pour in a dish and serve!